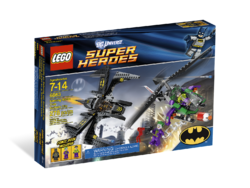 6863 Batwing Battle Over Gotham City is a DC Universe Super Heroes set released in late 2011, intended for ages 7–14. It includes Batman, The Joker, a Joker Henchman, the Batwing, and The Joker's Helicopter. 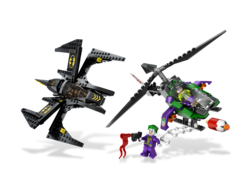 It is very similar to 7782 The Batwing: The Joker's Aerial Assault from the 2006 Batman theme. Batwing Battle Over Gotham City is made up of two parts; Batman's Batwing and The Joker's helicopter. The Batwing is styled to resemble the bat-logo on Batman's chest, but the plane is much more angular than the rounded logo. As all of Batman's vehicles, the Batwing is black, but also has a little bit of yellow on the decorative logos on the wings and the arrows on the "bat's head". The Joker's helicopter is coloured mostly green and purple, but also uses black in areas like the rotors and skis. The Henchman pilots the helicopter, which is only large enough to hold one person, while The Joker dangles on a white rope ladder attached to the skis. Between the skis is a red and white "laughing gas" bomb which can be dropped. There are also two red guns attached onto the helicopter's sides. This set could be based on a scene from the 1989 Batman movie where The Joker uses a helicopter as a getaway vehicle after attempting to spread laughing gas across Gotham City, but is stopped by Batman in the Batwing. According to the set description, The Joker is planning to drop a laughing gas bomb on Gotham City, which Batman tries to prevent. The Joker Henchman is exclusive to this set. In the comic, the laughing gas bomb's "nose" is purple instead of orange. In some releases of this set, Batman includes the new Bat-Cowl mould used in the sets from late 2012 forward. This is a description taken from LEGO.com. Please do not modify it. (visit this item's product page) Stop The Joker™ from dropping ‘toxic laughing gas’ on Gotham City! Facts about "6863 Batwing Battle Over Gotham City"